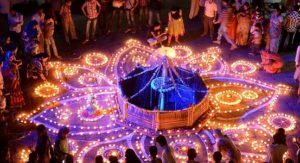 India During The Festival Season - Travelling around Diwali, Holi and Co.
One universal truth about India is that festivals are probably the best inside look at the country’s culture. Most have colourful stories and rituals attached to them and additionally the people really know how to celebrate in style. Let’s just take you through a few of the famous festivals so that you can get a hang of travelling to India during the festival season. Diwali brings in the Hindu New Year. Ram is the hero in the ‘Ramayan,’ an ancient epic poem, returns home after defeating Ravan, a ten-headed demon who abducts his wife. Called the ‘Festival of Lights’, it’s the most celebrated in India with lamps, lanterns, firecrackers and the Diwali Pooja (prayer ceremony). When do we celebrate Diwali? The festival dates depend on the moon calendar and usually fall between mid-October and mid-November. It lasts five days and begins with preparations, shopping and decoration and finish with family gatherings. The third day is New Year’s Eve (the day of Diwali). In 2018, Diwali will be on November 7th, in 2019 on the October 27th and in 2020 on November 14th. To find out what else to look forward to around this time of the year check out our blog articles on weather in October and November. Where is the best place to enjoy Diwali? Diwali is mostly celebrated amongst family and relatives. However, it’s still a fantastic time to visit all over India as houses are being decorated in lively colours and bright lights. On Diwali, itself the fireworks are incredible to watch. Celebrations are a little bit more extensive in North India. In Varanasi, they conduct huge Diwali aartis (religious ceremonies) with elaborate lamps and chants at the Ghats. Rajasthan is a great place to visit as it has many homestays where guests can participate in the family’s festivities. As metropolises, Delhi and Mumbai offer large celebrations all over the cities but due to the firecrackers the noise and air pollution can be a real nuisance. If you’re travelling to India during the Diwali season, make sure you book well in advance. Train tickets, hotel bookings, guides, everything becomes harder to get and/or more expensive during this time. For more details on Diwali, check this page out. Called the Festival of ‘Colours’, this vibrant festival is a celebration of the bounty of spring. People bathe each other in dry and wet colours, have rain dances, drink bhang (a drink with cannabis paste) and thandai (a drink with milk and many spices). It’s usually the day after the full moon in March (the day before in some eastern parts). On the night of the full moon people burn a Holi pyre on which the mythical demon Holika is placed to symbolize the destruction of evil. The next day, people start the colour party early and rest on the afternoon. In 2019, Holi will be celebrated on March 21st, in 2020 on March 10th and in 2021 on March 29th. Where is the best place to enjoy Holi? Holi is almost entirely celebrated in North India. In the south, there will be few small-scale religious ceremonies on the same day in certain temples. Resorts and hotels in Goa will sometimes offer commercial Holi Parties. 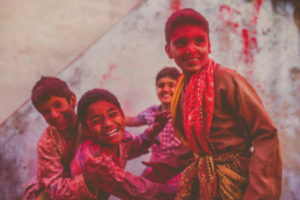 You can experience Holi in Rajasthan, Uttar Pradesh (Barsana, Mathura, Vrindavan), West Bengal (Shantiniketan, Kolkata) as well as Delhi and Mumbai. Almost every household and the younger generation in the north celebrate by playing with dry colour and water on the streets. We hate saying this, but unfortunately Holi is not always entirely safe for women on the street during the festival. This is more so the case in busy places such as Vrindavan, Varanasi or Pushkar. Clothes are completely drenched, everyone is a little high and the young boys in the huge crowd feel very brave and occasionally decide to leave any moral behaviour at home. Of course it’s your choice in the end, but we recommend celebrating at small guesthouses and homestays with other travellers and local families, rather than the massive crowds. Another thing to watch for is if the colours being used are organic and not toxic which could cause rashes and other issues. All in all, the trick to enjoy Holi is to stay safe but go into it with no inhibitions. This is South India’s harvest festival with flower decorations on floors outside all houses. This is to welcome the mythical Ashura King Mahabali. People shop and prepare feasts. There’s a lot of singing, dancing and games but the highlight is the snake boat races, definitely a must when travelling in India during the festival season. Onam starts in the first month of the Malayalam Calendar and last 13 days. In 2019, the first day will be September 1st, in 2020 on August 22nd and in 2021 on August 12th. The day that people celebrate the most is the 10th Day called Thiruvonam. Where is the best place to enjoy Onam? Celebrated in Malyalam speaking parts of South India, Onam is really big in Kerala. 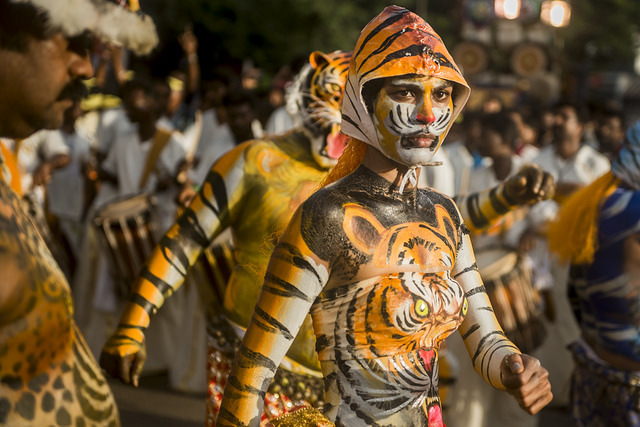 Especially Thrissur’s festivities with its Puli Kali (tiger play) festival on the last day of Onam is remarakable. If you’re travelling to Kerala during Onam make sure you make bookings much in advance before ticket prices sky rocket and the best accommodations gets occupied. It’s celebrated in Malyalam speaking parts of South India, so it’s very big in Kerala. Thrissur’s Puli Kali (tiger play) festival on the last day of Onam is an incredible and unique experience. If you’re travelling around the festival season to Kerala, make sure you book heavily in advance. Prices will sky rocket and soar and all the best accommodations fill up. Here are some travel routes around South India that are worth the visit. Eleven days of festivities and colourful processions carrying Lord Ganesha idols characterize Ganesh Chaturthi. It’s a celebration of the birthday of the Hindu god with an elephant head. Ganesha statues are worshipped for a few days in homes and public stalls, then submerged (Visarjan) in the sea or river in style. The popular festival falls on the 4th day of the new moon in August or September and lasts 10 days. In 2019, it will be celebrated on September 2nd, in 2020 on August 21st and in 2021 on September 10th. Families can choose how many days they want to celebrate it with poojas (praying ceremonies) happening at home every day. Most families celebrate it small scale at home for 1.5 to 3 days. However, many families, companies, housing societies, religious organizations with bigger statues (=more wealth) celebrate it for 10 days at home or the public stages. On the 11th day the icons, sometimes up to 70 feet tall, parade through the streets and finally are submerged in the water. Where is the best place to enjoy Ganesh Chaturthi? Mostly celebrated in the state of Maharashtra and by Maharashtrians elsewhere in India, you can find the biggest public Ganesha displays and processions in Mumbai. The festivities go hand in hand with heavy traffic, blocked routes and a lot of noise on the streets. The crowds at the beaches of Mumbai, especially at Chowpatty in the South, are extremely large. However, due to its quirky character and intensity, it’s a great experience. If you want to travel south from Mumbai after Ganesh Chaturthi check out this route suggestion. 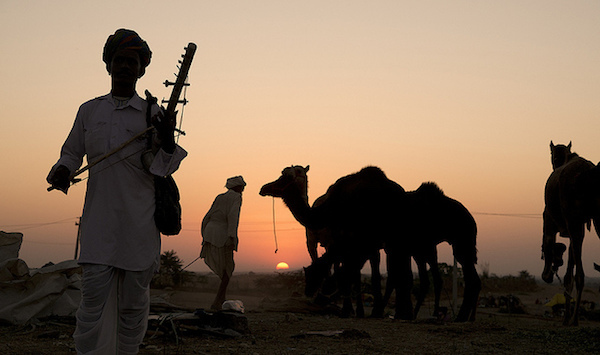 Held in Pushkar, Rajasthan, the famous camel fair is a 15 day festival. It’s actually less a festival and more an interesting get-together of camel owners and merchants. Truly a sight that is fun to observe for foreigners. When and how do we celebrate the Pushkar Camel Fair? The dates coincide with the Hindu Lunar Calendar, and lasts for 12 days. In 2018, the official Pushkar Fair starts on November 15th; in 2019 it begins on November 4th and in 2020 from November 22nd. The first five days are for camel trading and fair activities in the outskirts of the city. Camels are nicely prepared for the occasion. There are camel beauty pageants, dancing contests, races and whatnot. Musicians, acrobats, dancers, magicians, carousel rides, snake charmers; this fair has everything you’ve associated with India before coming. The last days, Hindu pilgrims flood the city to conduct rituals in the holy lake. The final night, thousands celebrate by lighting up the lake with oil lamps and setting countless fireworks. If you’re planning on visiting Rajasthan during the fair, book well in advance and be prepared to pay 10 times more than usual in Pushkar around the year. And be careful of “godmen” and other freeloaders trying to fleece you. Find out what other places you can visit in Rajasthan here. Do you want to experience any of these Indian festivals while visiting? Or do you want to find out what other festivals might happen during your travel dates? Plan your trip with us now and we make sure you experience the whole cultural richness of India and its exotic festivals.